I have encountered a new anxiety with my latest foster dog, Yukon. Yukon appears to have leash anxiety. Now I have nothing to base this on except observing Yukon’s behavior on and off leash. Leash anxiety is not his only anxiety but I am thinking it may be the biggest one as every extreme reaction he has had all have one thing in common – the leash. Yukon in the wild before capture, taken with telephoto lens. 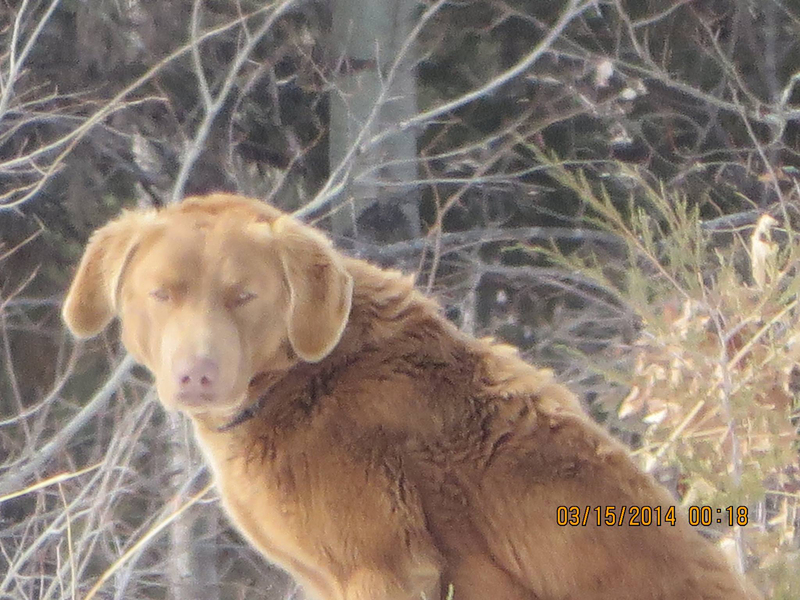 Yukon’s background – Yukon spent the winter of 2013-2014 roaming a rural neighborhood north of Minneapolis, MN. The neighbors tried to coax him in with food but he would not allow anyone within 100 ft of him. The first sighting of Yukon was September of 2013 and he was captured in a live trap by “The Retrievers” on March 22, 2014. Amazingly once Yukon was captured he could not get close enough to people. He has been a snuggler, except when on leash. Unfortunately I am a slow learner and it has taken me about 6 weeks to put all of the pieces together to realize the leash might be the issue. I have also figured out that food/treats are okay if everything around Yukon is okay. However, if he is stressed or anxious, forget food! He will have NO part of food if he is stressed. 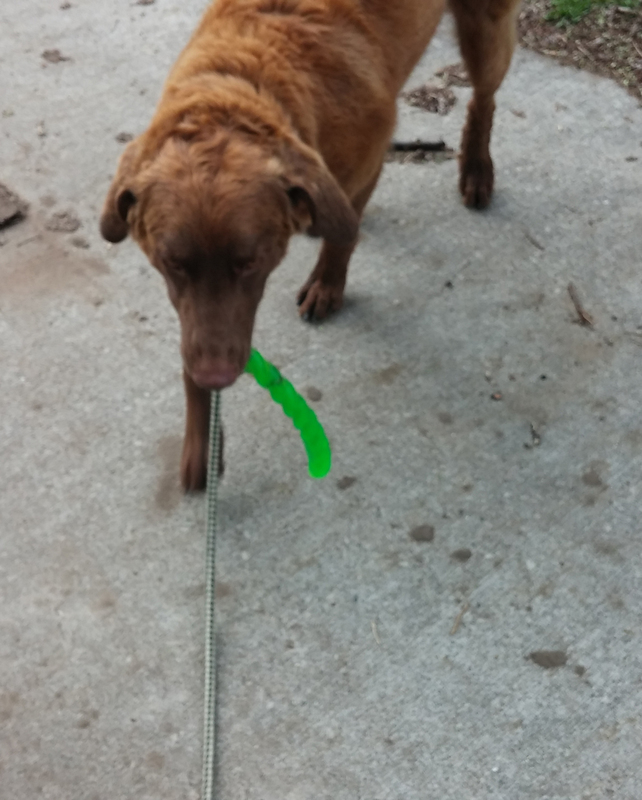 The one thing that Yukon cannot resist is a toy and retrieving. Monday I decided to combine greatest fear with his greatest pleasure and see if we can associate the two and make leash a fun thing. It is interesting to note that he goes nuts (happy nuts) when I get his harness and leash out, but when we get on the sidewalk he is looking for bogey men everywhere. So the next part of my strategy was to do this not on the sidewalk but in the alley where there is little traffic (vehicular or human) and the area is wide yet somewhat enclosed by the garages. Day 1 – We just walked, played fetch with his favorite Kong Stix and worked on sit. Now the key to this playing fetch is not long line fetch but 6 ft leash fetch with me holding the end and not dropping it. The throws are VERY Short (2-3 feet) and then I have him come back to me. 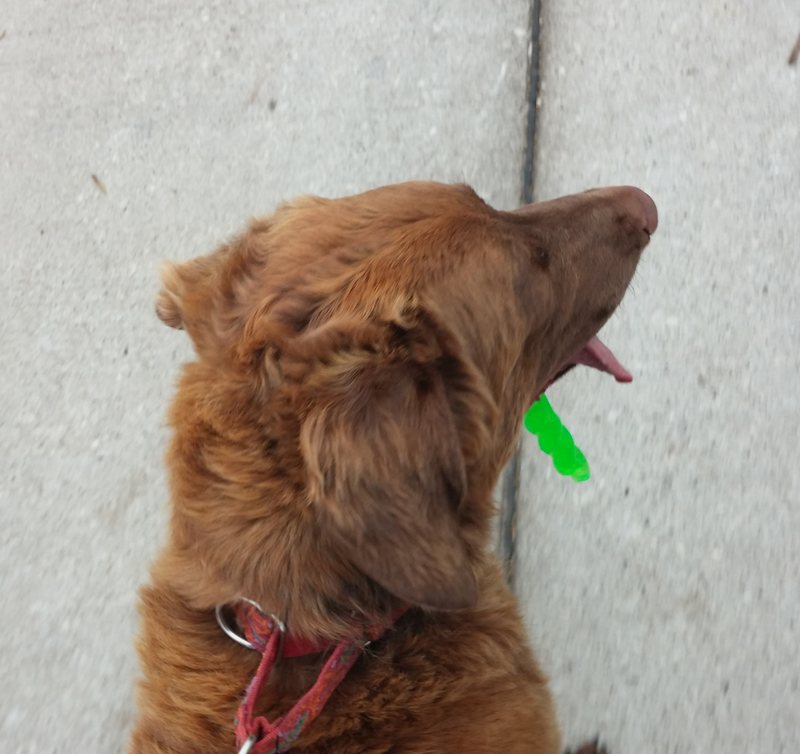 Sometimes I let him carry the Kong Stix in his mouth while we are walking. Sometimes I carry it but we always try to have fun and keep him focused on me. Entire session was no more than 10 minutes and we were never more than 2 garages away from my garage. Yukon doing a leash retrieve. Day 2 – Day 2 went even better! Our sessions are only about 10 minutes long but he was focused on me and the Kong Stix. He had fun. We incorporated a few stays into the routine today and he did pretty well with those. He was still pretty anxious but at least his focus was on me and not looking for every boogie man in sight! We then went for an 8 block car ride with Radar and only barked at one set of runners. Granted they were the only people on our trip but hey progress is progress. His reward was playing with the big red Teaser ball in the backyard. That is the ultimate reward for Yukon! 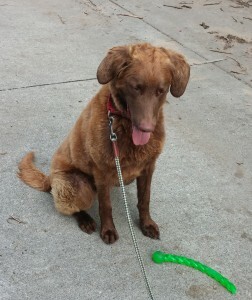 Yukon focused on his Kong Stix in a Sit/Stay. Day 3 – We worked on walking on leash (heel), sit and stay. Rewards for 10-15 strides was 3-4 retrieves. Again the retrieves were 2-3 feet and today I asked Yukon to sit and stay. Everything was fun, always active. Stays were very short and rewarded with me returning to him and then a retrieve. We encountered a squirrel and had a little trouble but got his focus back to me within seconds. We tried one retrieve up the sidewalk at the end of the alley and found it was too much. I had tossed the Kong Stix onto the sidewalk from the alley and Yukon would not go get it. So I retrieved the Stix and tossed it onto the alley and he happily retrieved it. (hmmmm, sidewalk is much narrower so must be a stressor.) We retrieved, sat and stayed our way back to my garage very well and Yukon was having a ball so I decided to test one more theory – traffic. My block sits between a very quiet street which is the direction we always go and a VERY busy street (direction we rarely go). I decided to walk past my garage towards the busy street and see how he reacted. He was fine as long as we were playing fetch and doing our sits and stays. The minute I sensed any anxiety, I turned and started back to my garage and ended the session with some retrieves off leash in the backyard as an ultimate reward. Yukon bringing his Kong Stix back to me on a leash retrieve. Day 4 – Today was a repeat of Day 3. 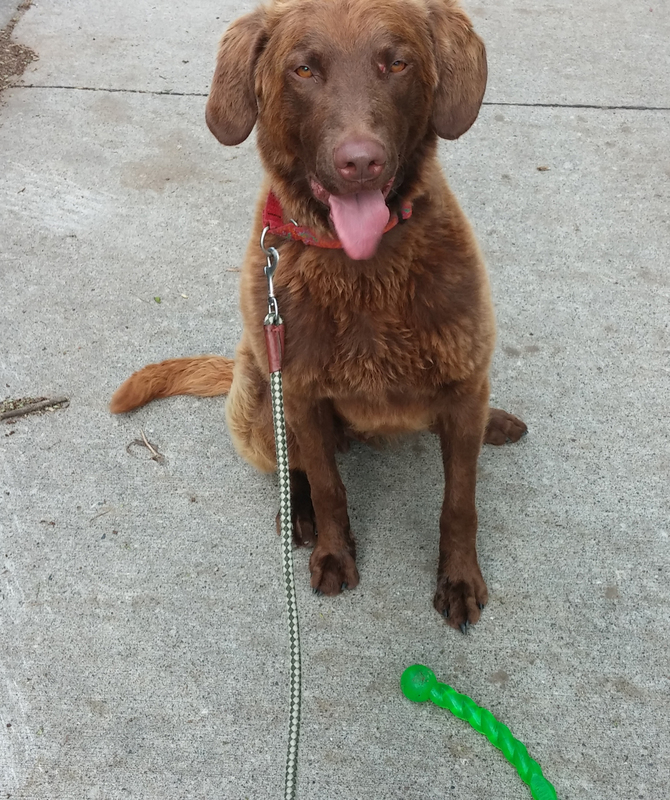 Walking on leash, sit, stay and retrieving. Yukon was really focused on me did great. We took a few more strides on leash with 2-3 retrieves between each walk. 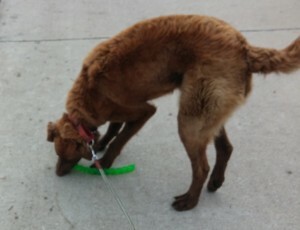 Yukon is much more relaxed walking in the alley with his Kong Stix in his mouth. Sometimes he drops it and I just pick it up and we keep walking. Today as we neared the quiet street at the end of my alley, the city bus was about to come up the street so we crossed the street and played fetch in the alley across the street as the bus passed. No problems! We then took a few strides up the quiet street but in the street. He is a little more anxious in the street but still willing to play fetch. After about 6 strides up the street and a few retrieves, we turned around and walked back to the alley. As we entered the alley, I heard someone say “Hi”. Yukon and I both looked and bicycle went by and Yukon had no reaction! He had his Kong Stix in his mouth and just watched from where he was!!! I decided that was a good ending and we retrieved our way back to my garage and ended the session with some on leash retrieves in front of my garage. Yukon waiting to be released from his sit/stay. 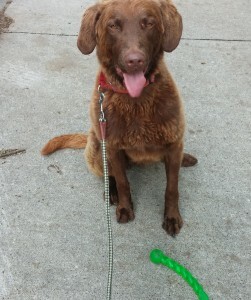 Day 5 – Day 5 was a short session because Yukon spent the afternoon at doggie daycare. When I picked Yukon up at daycare, a lady came in to pick up her dog. Yukon as I would have predicted barked and started to lunge at her. I simply started walking him back and forth in the lobby with the lady a good distance away. I asked him to be “Quiet” and kept walking him trying to get his focus onto something else and channel his energy. After several walks back and forth he quite barking and then wandered over to the lady to be petted. This just confirms my theory with him that he just needs a little time and acclimation to deal with the surprises in life. When we got home we did a few sit/stays and retrieves. We mostly walked on leash because he was tired and not as anxious. A neighbor walked down the alley towards and Yukon had no reaction he was somewhat focused on his Kong Stix. Very successful training day! Week 3 – Yukon has been doing better on leash and did very well at obedience class so we decided to venture out of our immediate block. He is okay until we encountered a bike and he went over threshold. The rest of the walk was out of control as he was way over threshold. I came home and let him off leash in the backyard. He ran around, played with his ball and settled down. I decided to try a different approach on the front side of my block with high value treats (bits of steak and hot dogs). Yukon will not always take treats out of my hand but I found he loves to hunt for them on the ground. So we walked up to the corner to work on triggers. Every time a person, car or bus approached, I would allow Yukon to see the trigger and then I started tossing treats around on the sidewalk. This worked great. We spent about 15 minutes on the corner and saw many of the triggers that set him off on our walk. By getting him to look at the trigger and then look for a treat, it became a game that he really enjoyed. Will try this same method again tomorrow.